The ultimate Red Velvet Profile 2016 - OH MY KPOP! We have gathered all the facts about Seulgi and we think you will love what we have for you. Her birth name is Kang Seulgi. She was born in Toronto, Canada. Joy was born in Seoul, South Korea. We tried to put the most important facts about Red Velvet on the list. But we will add more informations about the group, its members and releases in the future. They released their first single “Happiness” on August 4, 2014. Red Velvet released their first mini album on March 15, 2015. Yeri was added as a new member to the group. They performed in Los Angeles in August 2015. 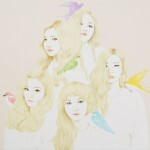 Red Velvet released their first full studio album on September 9, 2015. Check out more charted songs here. All the Red Velvet members have a unique style and sense of fashion. We had a look for some beautiful outfits and we will help you too copy their style. Coming Soon! Here you can find all the tour and event dates of Red Velvet. There are no current events scheduled in your area.